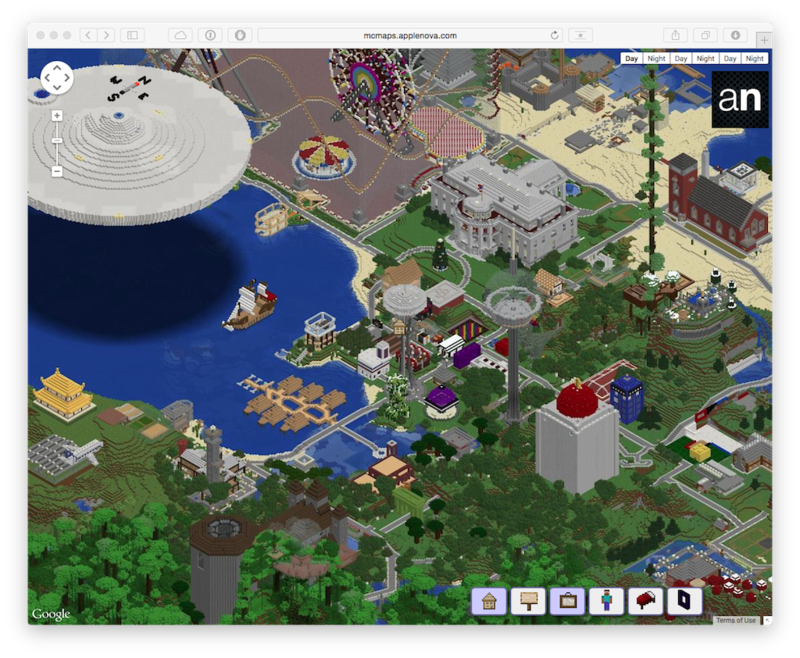 As you would imagine, you can zoom in and out and see all the latest projects. I will generally keep the map rendered once a week or so but attempt to keep the players updated nightly. I'm still working out the bugs on this, but should have it totally automated in short order. With this mapping program you can display special signs! I currently have the players in view limited to the players on our white-list. If you really don't want yourself visible in the map, PM me a compelling reason you shouldn't be visible and I'll edit the list for my generation purposes to remove you from the map. Choose between day or night in the upper right corner. Choose which options you'd like to have displayed in the bottom right corner. Have fun exploring your world! Last edited by Brad : 2011-07-14 at 20:24. Reason: Had to correct a few things. Tell 'em how many GB all the image files take up! Glad to see this finally go live and that you worked out all the kinks, T. Good work! Why is Batman crouching on my walkway? What's he about to do??? Is the Joker hanging out around my beach house??? If you do point your map browsing down south, check out my lovely ice tree: I'd link to it but links seem to be consistently too far North-East for some reason. Yeah, so this was a pain to get onto the server to say the least. It takes minimum of 5 hours to render the maps. Uploading via FTP took more than a day. Thus my thread about rsync and other transfer options. After getting home today I pulled the world files because no one was on so I could test render and rsync. Using the same cache as before it only took 46 minutes to do the partial render. I'm currently doing the rsync but am not timing it this time. Anyway, thank you for the compliments guys. I do hope you all enjoy the maps. Maybe we'll get some more love from the non-MC guys here at AN. This REALLY helps me understand where things are! Night view is totally badass. Just thought I'd mention that. Now that I know where they are, I'm going to go sleep in all of your beds! Muahahahah! I'm just trying to figure out why Grey has a naked man in his house? Bryson is taking a skinny-dip in my pool it looks like. I've also been sitting on your pillow. I hear you can get ointments for pinkeye that are really effective. I don't understand the whole "bed" thing. Maybe I need a class on MC beds. Happened to me too, I think it coincided with an update, i.e. it was a bug. Just sleep there again and you'll be fine. Last edited by Kraetos : 2011-07-12 at 22:59. So it looks like the views option is causing some challenges to work through. I've created a Temp Down page so you will see when it's specifically me doing something. Anyway, just thought you might want to know. Dude. I was just on and NOBODY was there, but you're in here posting!! S'okay, though, I need to be going to spleep. It has not been fun with these views. It's crashed out just about every time. Worst part is that the map produced last night as I went to bed produced a default Google Maps page rather than our map. So I'm running it a few more times before heading to work in hopes that it will function properly. So far so good, however I won't be able to initiate the uploading of it until getting back home if this one does work. Maybe you should only do this every 4 weeks? Don't put such pressure on yourself to run it so frequently or you'll burn out on the process! Solution: disable views. More trouble than they're worth. I just might disable views. I figured out the offending view was mine I had placed at the Park for the arches. Oh well. I'm at work on lunch break right now so I can't rsync it yet...or check on if it completed. I did remove my view before leaving though. I'll get it back up ASAP after getting home. Views just might go bye bye too. I'll play with it a little more though. Views are a nicety, but not essential. Especially if they're killing the thing. I'm interested by the "block count" at home. Only 6 jukeboxes? 1 sponge? Let's find it! Maybe I shouldn't admit that though. That one sponge has been around since last year, too.